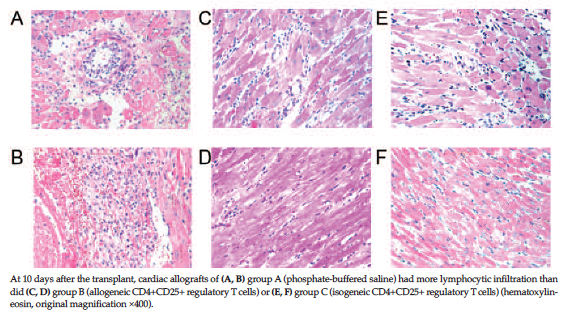 Objectives: To evaluate the effect of isogeneic CD4+CD25+ regulatory T cells on cardiac allograft tolerance in heterotopic heart transplant from Balb/c to C57BL/6 mice. Materials and Methods: Isogeneic and allogeneic CD4+CD25+ regulatory T cells were obtained from pregnant C57BL/6 mice crossed with male Balb/c mice and from regular Balb/c mice. Recipient C57BL/6 mice were treated with sublethal radiation (2 Gy) and an infusion of isogeneic CD4+CD25+ regulatory T cells, allogeneic CD4+CD25+ regulatory T cells, or phosphate-buffered saline alone 1 day before a Balb/c-to-C57BL/6 heterotopic heart transplant. At 10 days after the transplant, cardiac allografts and the sera of recipients were evaluated with histology and cytokine analysis. Splenocytes of recipients were collected to determine chimerism on the day of the cessation of allograft heartbeat. Results: Mice that received an infusion of isogeneic CD4+CD25+ regulatory T cells had significantly greater mean median survival time, greater degree of chimerism, decreased levels of cytokines (monokine induced by interferon γ, interleukin 6, interleukin 10, and regulated upon activation, normal T cell expressed and secreted protein), and decreased lymphocytic infiltration than did mice that received phosphate-buffered saline alone. The effects on allograft tolerance were stronger in mice that received the isogeneic than the allogeneic CD4+CD25+ regulatory T cells. Conclusions: Isogeneic CD4+CD25+ regulatory T cells may establish cardiac allograft tolerance by inducing mixed chimerism and suppressing immune responses. Infusion with isogeneic CD4+CD25+ regulatory T cells combined with radiation (sublethal dose, 2 Gy) may establish allograft tolerance in mice. Therefore, further study is warranted because isogeneic CD4+CD25+ regulatory T cells may have therapeutic benefits. The purpose of the present study was to evaluate the effect of regulatory T cells on the establishment of transplant tolerance. At 1 day before heterotopic heart transplant (donor, Balb/c mice; recipient, C57BL/6 mice), we transferred CD4+CD25+ regulatory T cells with a specific genotype obtained from pregnant C57BL/6 mice (female C57BL/6 × male Balb/c) to recipient C57BL/6 mice that received sublethal irradiation (2 Gy) without bone marrow transplant or immunosuppressive therapy. We found that isogeneic CD4+CD25+ regulatory T cells could induce mixed chimerism and suppress immune responses by down-regulating production of monokine induced by interferon γ (MIG), interleukin 6 (IL-6), interleukin 10 (IL-10), and regulated upon activation, normal T cell expressed and secreted protein (RANTES). Therefore, infusion with isogeneic CD4+CD25+ regulatory T cells combined with sublethal radiation may induce allograft tolerance in mice. The CD4+CD25+ regulatory T cells were isolated from mouse spleen cell suspensions by magnetic-activated cell sorting using a commercially available kit (CD4+CD25+ Regulatory T-Cell Isolation Kit, Miltenyi Biotech, Cologne, Germany). The CD4+ T cells were enriched by depleting unwanted spleen cells that expressed CD8, CD11b, CD45R, CD49b, or Ter119 after lysis of erythrocytes, and CD25+ T cells were selected from the enriched CD4+ T cell fraction. Isogeneic CD4+CD25+ regulatory T cells were obtained from pregnant C57BL/6 mice that had crossed to male Balb/c mice. Allogeneic CD4+CD25+ regulatory T cells were obtained from regular female Balb/c mice. Isogeneic (2 × 106 cells) or allogeneic (2 × 106 cells) CD4+CD25+ regulatory T cells were suspended in phosphate-buffered saline (0.2 mL) and injected via the femoral vein into recipient C57BL/6 mice. The 3 experimental groups (6 mice each) included C57BL/6 recipient mice that received phosphate-buffered saline (0.2 mL) alone (group A; control), allogeneic CD4+CD25+ regulatory T cells (group B), or isogeneic CD4+CD25+ regulatory T cells (group C) 1 day before the heart transplant (day 0, T cell, or phosphate-buffered saline infusion; day 1, and the heart transplant surgery). All recipient C57BL/6 mice received sublethal radiation from a cobalt 60 source (2 Gy) 12 hours before they received the infusion of regulatory T cells or phosphate-buffered saline. Cardiac allografts and sera of recipients were collected for histology or cytokine analysis 10 days after the heart transplant. Splenocytes of recipients were collected to determine the chimerism on the day of the cessation of graft heartbeat. A heterotopic heart transplant was performed between whole male mice that were incompatible by major histocompatibility complex class (donor, Balb/c; recipient, C57BL/6) as described previously.10 Brieﬂy, end-to-side anastomoses were created between the donor aorta and the recipient abdominal aorta, and between the donor pulmonary artery and the recipient inferior vena cava. After perfusion with the recipient’s blood, the transplanted heart resumed contractions spontaneously within 30 seconds. Graft function was monitored by abdominal palpation daily. Rejection was defined as complete arrest of contraction, which was confirmed by direct visualization. Chimerism on leukocytes was determined by flow cytometry. Cell suspensions were prepared from spleens of recipient C57BL/6 mice on the day that the graft heartbeat stopped. A sample of cells (1 × 106 cells) was stained with donor-specific allophycocyanin-conjugated antimouse major histocompatibility complex class I antibody (a3 domain of H-2Kd) (eBioscience, Inc., San Diego, CA, USA) for 20 minutes at room temperature. The cells were then washed and analyzed by BD FACSCalibur flow cytometer (BD Biosciences, Franklin Lakes, NJ, USA). Data were analyzed with FloJo software (Tree Star, Inc. Ashland, OR, USA). The degree of chimerism was analyzed in the recipient C57BL/6 mice from groups B and C. Recipient C57BL/6 mice from group A were used as a negative control, and donor Balb/c mice were used as a positive control. Sera of recipient C57BL/6 mice were collected 10 days after the heart transplant and analyzed by a multiplexed cytokine bead-based immunoassay using a preconfigured 4-plex mouse cytokine detection kit (Luminex, Millipore, Billerica, MA, USA) according to the manufacturer’s instructions. This cytokine detection kit included 4 types of antibody-immobilized magnetic beads specific to MIG, IL-6, IL-10, and RANTES. Concentrations of cytokines were determined with the Luminex 200 instrument (Millipore, Billerica, MA, USA). Allografts were removed to evaluate the presence of lymphocytic infiltration 10 days after the heart transplant. Grafts were fixed in 10% formalin, embedded in paraffin, sectioned (3 μm), and stained with hematoxylin-eosin. All specimens were reviewed by the same histologist who was blind to the treatment. Data were reported as means ± standard deviation. Graft survival was evaluated with Kaplan-Meier method. Comparisons were evaluated with a Mann-Whitney U test or an unpaired t test. Statistical significance was defined by P ≤ .05. 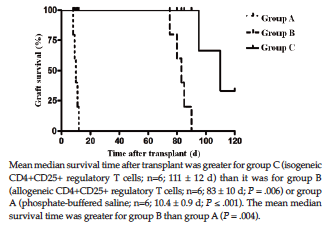 Mean median survival time was significantly greatest for mice that received isogeneic CD4+CD25+ regulatory T cells (group C), and least for mice that received phosphate-buffered saline control (group A), 1 day before heart transplant (Figure 1). Therefore, isogeneic CD4+CD25+ regulatory T cells and radiation signiﬁcantly prolonged the survival of cardiac allografts. 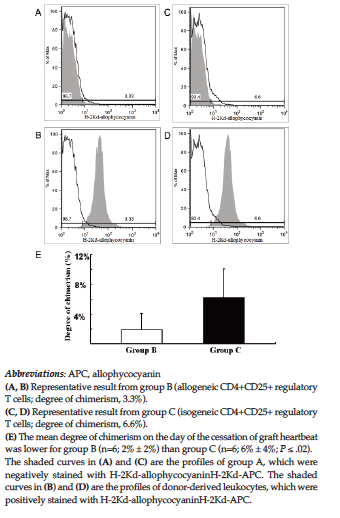 The degree of chimerism was greater for mice that received isogeneic (group C) than allogeneic (group B) CD4+CD25+ regulatory T cells (Figure 2). Therefore, isogeneic CD4+CD25+ regulatory T cells induced mixed chimerism successfully. The mean serum levels of MIG, IL-6, IL-10, and RANTES at 10 days after the heart transplant were decreased in mice that received allogeneic (group B) or isogeneic (group C) CD4+CD25+ regulatory T cells before transplant (Table 1). 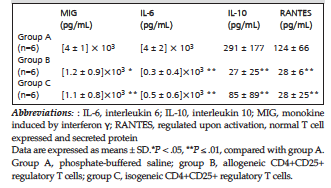 The mean level of these cytokines was similar between mice in groups B and C (Table 1). Therefore, CD4+CD25+ regulatory T cells suppressed the activation of other T lymphocytes in heart transplant recipients, independent of the genotype of the regulatory T cells. At 10 days after the heart transplant, lymphocytic infiltration was markedly less in mice that received allogeneic (group B) or isogeneic (group C) CD4+CD25+ regulatory T cells than phosphate-buffered saline alone (group A) before transplant (Figure 3). Therefore, regulatory T cells decreased lymphocytic infiltration into allografts. This study showed that infusion of isogeneic CD4+CD25+ regulatory T cells combined with radiation (sublethal dose, 2 Gy), induced cardiac allograft tolerance across human leukocyte antigen mismatch barrier by establishing mixed chimerism and suppressing recipient immune responses. Isogeneic CD4+CD25+ regulatory T cells were obtained from pregnant C57BL/6 mice that had been crossed with male Balb/c mice. During pregnancy, fetal cells likely entered the maternal circulation and made the mother chimeric.11 Therefore, isogeneic CD4+CD25+ regulatory T cells should be a mixture of C57BL/6-derived and Balb/c-derived CD4+CD25+ regulatory T cells. In contrast, allogeneic CD4+CD25+ regulatory T cells were completely derived from Balb/c mice. The isogeneic CD4+CD25+ regulatory T cells had the genotype identical with both recipient C57BL/6 and donor Balb/c mice; allogeneic CD4+CD25+ regulatory T cells had the genotype identical only with the donor Balb/c mice. The higher degree of mixed chimerism induced by isogeneic CD4+CD25+ regulatory T cells was caused by the special genotype of these cells (Figure 2). Allografts in mice infused with isogeneic CD4+CD25+ regulatory T cells (group C) had the longest survival time out of all the groups, and survival was longer in mice that received either isogeneic (group C) or allogeneic (group B) CD4+CD25+ regulatory T cells than did mice that received phosphate-buffered saline alone (group A) (Figure 1). The mixed chimerism likely was an important reason for the longer survival of allografts in groups B and C. However, mixed chimerism was not the only reason for improved allograft survival.12 In a previous study, the degree of chimerism induced by isogeneic bone marrow transplant was 6% ± 3%, similar to the degree of chimerism induced by infusion of isogeneic CD4+CD25+ regulatory T cells (Figure 2).12 The survival of allografts with isogeneic bone marrow transplant was 34 ± 14 days, shorter than that with infusion of isogeneic CD4+CD25+ regulatory T cells.12 Therefore, isogeneic CD4+CD25+ regulatory T cells may have effects that improve allograft tolerance in addition to the establishment of chimerism. The CD4+CD25+ regulatory T cells may control allograft rejection by affecting the activity of antigen-presenting cells and inhibiting effector T-cell proliferation and differentiation into the Th1, Th2, and the Th17 cells.8 In the present study, all 4 cytokines tested (MIG, IL-6, IL-10, and RANTES) were down-regulated in recipient C57BL/6 mice that had received allogeneic or isogeneic CD4+CD25+ regulatory T cells (Table 1). Therefore, the longer survival of allografts in mice that received isogeneic CD4+CD25+ regulatory T cells may have been caused by the weak alloresponse in the recipients. Expression of MIG is induced by interferon γ, which is released by a host CD8+ lymphocytes when they recognize alloantigen in the early stage of acute rejection.13 The cytokine MIG recruits T lymphocytes to the allograft and augments alloresponses.14 The proinflammatory cytokine IL-6 is produced by antigen-presenting cells and promotes the activation and proliferation of antigen-specific T lymphocytes, regulation of Th1 responses, and increase in Th2 or Th17 lineage development.15,16 The anti-inflammatory cytokine IL-10 is produced by various immune cells, including monocytes, Th2 cells, and regulatory T cells. However, the level of IL-10 present with rejection episodes is controversial.17,18 The other cytokine tested, RANTES, is expressed after activation of T cells, may recruit T lymphocytes, monocytes, natural killer cells, basophils, and eosinophils, and may activate immune cells.19 The CD4+CD25+ regulatory T cells may have down-regulated production of MIG, IL-6, IL-10, and RANTES by suppressing development of the Th1, Th2, and the Th17 cells, which release these cytokines. The status of allograft tolerance induced by isogeneic CD4+CD25+ regulatory T cells was confirmed with histology (Figure 3 ). The allografts that had less lymphocytic infiltration had better tolerance. Reduced lymphocytic infiltration in allografts also may have been caused by weak recipient immune alloresponse. Total body radiation also may have improved the induction of allograft tolerance by inactivating donor-reactive T cells.12 Total body radiation with a sublethal dose (2 Gy) appears safe, without apparent adverse reactions, and avoids adverse reactions associated with cytotoxic drugs used for recipient cytoreductive conditioning. In conclusion, isogeneic CD4+CD25+ regulatory T cells may establish cardiac allograft tolerance by inducing mixed chimerism and suppressing recipient immune alloresponses. Infusion of isogeneic CD4+CD25+ regulatory T cells combined with radiation (sublethal dose, 2 Gy) established allograft tolerance in mice without requiring lifelong immunosuppressive therapy. Therefore, further study is warranted because isogeneic CD4+CD25+ regulatory T cells may have therapeutic benefits. Montoya JG, Giraldo LF, Efron B, et al. Infectious complications among 620 consecutive heart transplant patients at Stanford University Medical Center. Clin Infect Dis. 2001;33(5):629-640. Dantal J, Soulillou JP. Immunosuppressive drugs and the risk of cancer after organ transplantation. N Engl J Med. 2005;352(13):1371-1373. Scandling JD, Busque S, Dejbakhsh-Jones S, et al. Tolerance and chimerism after renal and hematopoietic-cell transplantation. N Engl J Med. 2008;358(4):362-368. Kang SM, Tang Q, Bluestone JA. CD4+CD25+ regulatory T cells in transplantation: progress, challenges and prospects. Am J Transplant. 2007;7(6):1457-1463. Pilat N, Baranyi U, Klaus C, et al. Treg-therapy allows mixed chimerism and transplantation tolerance without cytoreductive conditioning. Am J Transplant. 2010;10(4):751-762. Starzl TE, Demetris AJ, Murase N, Ildstad S, Ricordi C, Trucco M. Cell migration, chimerism, and graft acceptance. Lancet. 1992;339(8809):1579-1582. Edinger M. Regulatory T cells for the prevention of graft-versus-host disease: professionals defeat amateurs. Eur J Immunol. 2009;39(11):2966-2968. Wood KJ, Bushell A, Hester J. Regulatory immune cells in transplantation. Nat Rev Immunol. 2012;12(6):417-430. National Institutes of Health. Guide for the Care and Use of Laboratory Animals (NIH publication no. 86-23). Bethesda: National Institutes of Health; 1985. Corry RJ, Winn HJ, Russell PS. Primarily vascularized allografts of hearts in mice. The role of H-2D, H-2K, and non-H-2 antigens in rejection. Transplantation. 1973;16(4):343-350. Bianchi DW, Zickwolf GK, Weil GJ, Sylvester S, DeMaria MA. Male fetal progenitor cells persist in maternal blood for as long as 27 years postpartum. Proc Natl Acad Sci U S A. 1996;93(2):705-708. Chen Z, Jiang H, Chen R, et al. Survival time of cardiac allografts prolonged by isogeneic BMT in mice. Bone Marrow Transplant. 2012;47(8):1118-1125. Kapoor A, Morita K, Engeman TM, et al. Early expression of interferon-gamma inducible protein 10 and monokine induced by interferon-gamma in cardiac allografts is mediated by CD8+ T cells. Transplantation. 2000;69(6):1147-1155. Miura M, Morita K, Kobayashi H, et al. Monokine induced by IFN-gamma is a dominant factor directing T cells to murine cardiac allografts during acute rejection. J Immunol. 2001;167(6):3494-3504. Booth AJ, Grabauskiene S, Wood SC, Lu G, Burrell BE, Bishop DK. IL-6 promotes cardiac graft rejection mediated by CD4+ cells. J. Immunol. 2011;187(11):5764-5771. Zhao X, Boenisch O, Yeung M, et al. Critical role of proinflammatory cytokine IL-6 in allograft rejection and tolerance. Am J Transplant. 2012;12(1):90-101. Karczewski M, Karczewski J, Poniedzialek B, Wiktorowicz K, Smietanska M, Glyda M. Distinct cytokine patterns in different states of kidney allograft function. Transplant Proc. 2009;41(10):4147-4149. Alberú J, Richaud-Patin Y, Vázquez-Lavista LG, et al. In vivo IL-10 and TGF-beta production by PBMC from long-term kidney transplant recipients with excellent graft function: a possible feedback mechanism participating in immunological stability. Clin Transplant. 2004;18(2):174-178. Krensky AM, Ahn YT. Mechanisms of disease: regulation of RANTES (CCL5) in renal disease. Nat Clin Pract Nephrol. 2007;3(3):164-170. Acknowledgements: This study was supported by grants from the National Nature Science Foundation of China (30900689); the Special Foundation of Young Scientists in Zhejiang Province (2009QN004); the Major Projects of Zhejiang Science and Technology Department (2008C13026-2); and the Foundation for University PhD (20090101120095). The authors declare that they have no competing interests.